Medistatin is used as the treatment of choice for fungal infections where direct contact with the infection is possible in the digestive tract. Medistatin is a powdered Nystatin and it does not cross into the bloodstream. 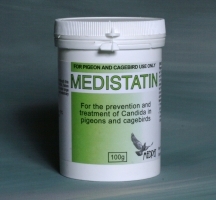 Medistatin is ideal for crop dosing while hand-feeding baby birds to prevent or cure yeast infections. Pigeons: Mix 5g with 1Kg of grain for 5-7 days. Grain to be lightly coated with oil to allow Medistatin to adhere to the grain. Other Avian Species: Mix 5g with 500g of seed or softfood for 5-7 days. Seed to be lightly oiled to allow Medistatin to adhere to the seed. 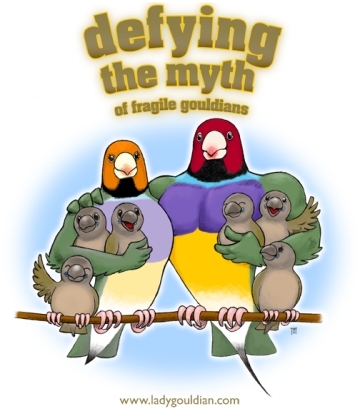 Hand Reared Chicks: Prevention: Mix 1g per 200g of soft food daily for as long as symptoms prevail. Treatment: Mix 1g per 20ml water, shake well and dose 1ml of mixture per 100g bodyweight twice daily.